The AS 332L (or SA 332L before 1980) Super Puma introduced a stretched fuselage (by 76.5cm/2.5ft), first flew on October 10 1980 and was certificated in 1983. The updated AS 332L1 with Makila 1A1 engines appeared in 1986. Bristow Helicopters ordered 31 specially customised AS 332Ls for its North Sea offshore oil rig work, and these are named Tiger. The AS332L1 Super Puma is one of the variants of Eurocopter Super Puma. 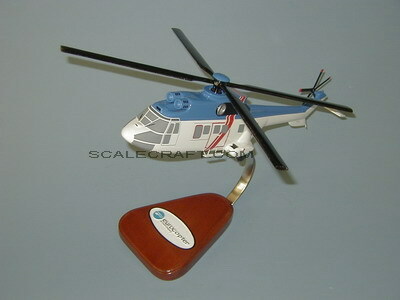 A helicopter marketed for civil and military use. The Super Puma was proved to be well suited for the North Sea oil industry where it is used to ferry personnel and equipment to and from oil platforms. As a variant of the Super Puma, the AS332L1 Super Puma is a twin turbine multi role civil helicopter with 20 comfortable seats in it. The AS332L1 was developed to improve and enlarge the Puma. The first flight of the AS332L1 Super Puma was on September 13, 1978 and its first deliveries were in mid 1981. The AS332L1 Super Puma is a twin engine medium weight civil helicopter. The extensive power reserve made the AS332L1 Super Puma the helicopter perfectly suited for offshore or other civil operations as well as for public use. Mahogany wood. Length 15 1/2 inches.